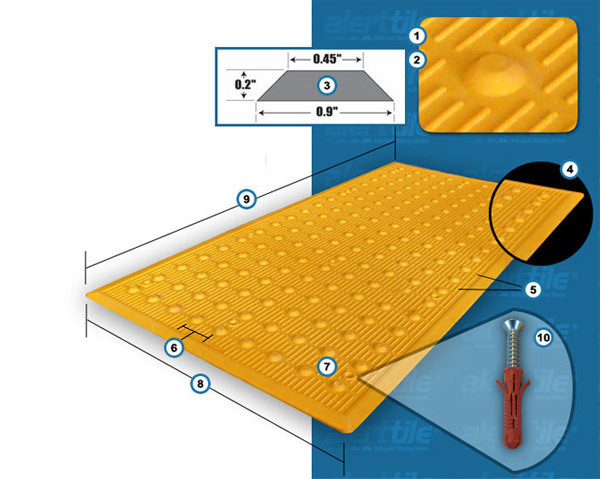 alerttile® is a glass reinforced thermoset composite engineered for superior impact resistance, slip resistance, wear resistance and long-term durability for retrofit applications. alerttile®‘s exclusive design incorporates a thin, slightly flexible profile with a perimeter beveled edge to provide a safe pedestrian transition. AlertTile® Truncate Domes are designed to comply with ADA standards. Premium Hilti HUD-1 anchors and stainless steel screws. Available in five standard colors to meet a variety of situations and preferences: Yellow, Colonial Red, Brick Red, Black and Grey. Tiles are available in the following sizes: 2′ x 3′, 2′ x 4′, 2′ x 5, 3′ x 4′, 3′ x 5′. Some of the properties published are based on test performed on standard ASTM test sample and according to ASTM test methods on standard, unaltered GPO-3 materials. Value shown are for test samples made from standard GPO-3 production materials and they are believed to be conservative. Where specific or unusual applications are needed, test should be made on actual parts, and test procedures agreed upon between Cape Fear Systems, III. LLC and the customer. Please reference alerttile® and AlertCast® Warranty for specific warranty information. Please call for additional information and product specifications.